Largely under the grouping of quarter turn locks we find spanner locks, insert locks and key locks – often also referred to as latches – although strictly speaking of course “latch” refers to the cam action itself which may not involve a key of any sort. 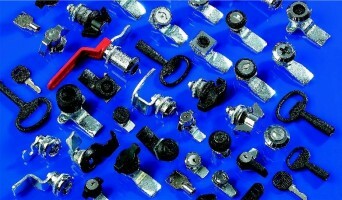 The term spanner locks describes a latch designed to be opened with a simple generic tool or key such as a spanner, screwdriver or coin and so offer very low security but often perfectly sufficient to the application where low risk or vulnerability is involved and where only trusted persons have access. Insert locks are a step up from there in that they require a specific tool such as a triangular key or “double bar” form to fit the barrel so the latch may be operated and the door opened. Then we have key locks which use a more generally recognised key to lock or release the mechanism restricting operation of the handle/latch. Spanner locks, insert locks and keylocks with a wide variety of handles are available from our catalogue – from extensive UK stock. Share the post "Spanner locks, insert locks, key locks and quarter turn locks"